Antonio Vega and Omen Sade in The Duchamp Syndrome. Photo by Carol Rosegg. BOTTOM LINE: A lonely Mexican immigrant living in NYC makes a vibrant life out of the objects and creatures he encounters in his janitor’s closet workplace. In 2013 I saw Por Piedad Teatro’s Working on a Special Day, which I adored. Using a minimal design and a very clever conceit by which the environment was drawn with chalk on chalkboard walls, the show’s ingenuity provided a highly effective audience experience. 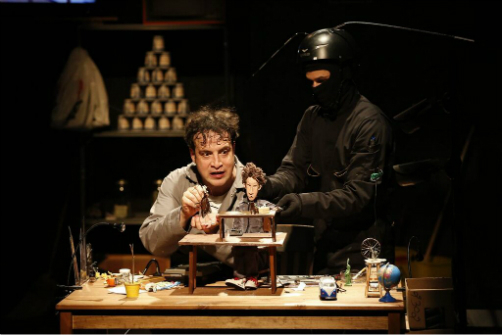 Por Piedad Teatro’s latest offering – another co-production with The Play Company – is equally clever. The Duchamp Syndrome tells the story of Juan (Antonio Vega, who also wrote the play), a Mexican immigrant living in New York City doing double-duty as a janitor and a night watchman. With his family and social circle back in Mexico and with a limited grasp of English, Juan is a lonely guy. However, he has an incredible imagination. In his workplace (some sort of janitor’s closet or basement room) Juan creates a full-fledged world using the items he finds, along with puppets of various sizes. Accompanied by “The Shadow” (Omen Sade), who literally plays Juan’s shadow (and is also a puppeteer), Juan lets the audience into his world as he recounts his story. Juan pursues a career as a stand-up comedian, and through a bit of audience interaction at the top of the show we see that this play is sort of structured as a stand-up performance, created especially for Juan’s mother, who was supposed to attend and observe her son’s successful comedy career in action. Of course, Juan’s success is only in his head. And his mom is still in Mexico anyway. Essentially The Duchamp Syndrome is a comedy, and since Juan is a comedian there is much musing on the business of being funny. But as Juan reminds us, comedy is just tragedy plus time. The circumstances surrounding his family life and current situation (along with some jabs at that illusive American Dream) are really quite tragic. It’s no wonder his loneliness rings truer than any jokes or physical gags made in spite of his situation. Additionally, Juan isn’t a very good comedian, so hilarity rarely ensues. Even a Redd Foxx bit performed by his foul-mouthed cockroach friend feels desperate amid Juan’s real troubles. When Juan finds out that his mom is finally coming to town, he needs to find a way to fabricate a performance to prove that he’s the great comedian he’s been pretending he is. Riffing on Marcel Duchamp’s Bicycle Wheel sculpture (something Juan sees at the MoMA in an existential “what exactly is art?” moment), he creates his own version of the structure, adding plastic hand-clapping noise-makers to the wheel to facilitate the effect of a grateful audience. His blind mother plays along, but she doesn't buy it. The Duchamp Syndrome certainly has a Dadaist quality itself, and its zaniness sometimes distracts from the story. Since everything on stage is a storytelling implement, it becomes a treat to watch the world transform. However, I often found my attention stuck on the environment instead of on the performers or puppets. Directors Vega and Ana Graham have created a magical world with surprises around every turn. The carefully calibrated show, along with the perfectly procured items inhabiting the space, enable a toy-store quality in an otherwise mundane existence. It’s with both delight and sadness that we watch Juan’s imagination at work.